Dave Mihelcic’s position as CTO remains unchanged. The CTO office will focus solely on uncovering innovative technologies, particularly those centered on automation. DISA’s S&T and R&D funding will fall under Dave’s oversight. So, not much of a change here. Mark Orndorff moves from what was the cyber security focused Program Executive Office for Mission Assurance to the office of the Risk Management Executive. His office will be in charge of cyber security standards and authorizations as well as training the cyber workforce DISA is standing up. I advise security and cloud vendors to stay acquainted with the standards and requirements coming out of this office because security products and commercial cloud vendors must adhere to the security requirements which originate and are enforced by Mark’s team. 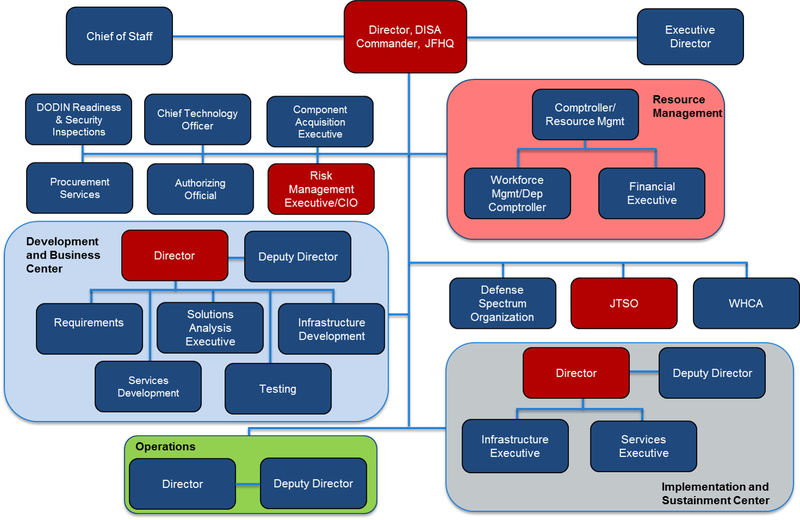 Headed by Alfred Rivera, this is where requirements come into DISA’s environment. Alfred Rivera should be at the top of your list of people to talk to because he is the single point of contact for new technologies and capabilities brought into the agency. The Development and Business Center decides for example, whether Solution X or Solution Y is the right choice for DISA to adopt; they conduct the funding profiles, pilots, and core competency tests needed to determine if a capability passes muster and graduates to the Program Executive Offices. Two subordinate offices, Infrastructure Development and Services Development, are where the mobility, cyber security, cloud, and network operations programs will be managed — so vendors specializing in these areas, take note. In addition, the Joint Capability Technology Demonstration and Forge.mil, DISA’s traditional technology test beds, now fall under this organization. This center, led by Dave Bennett, is in charge of implementing and sustaining DISA’s catalog of offered services, ranging from the agency’s computing services, application hosting, and telecommunications services, to name a few. Dave Bennett is effectively in charge of DISA’s working capital fund which collects revenues from the military services who use DISA’s data centers and network services. As you can imagine, this center will work closely with Rivera’s Development and Business Center as requirements are brought in. Bennett’s team will yield opportunities for vendors selling storage, voice/video/data, cloud and virtualization solutions. As somewhat of an aside, Dave is also tasked with finding an enterprise-wide records management capability for the agency which could be a single solution or multiple tools. Stay tuned. A new addition to the DISA family, the Joint Force Headquarters is in charge with defending the DOD network and is led by Brig. Gen. Robert Skinner. The Joint Force Headquarters operational date is January 15, 2015. JFHQ, comprised of 219 personnel, with partner with 39 other organizations within DOD and the government. Brig. Gen. Skinner emphasized the importance of working with the commercial world to build the tools they need so they have a better understanding of the DOD network and how to protect it. Make sure to check back next week for part II of this blog post where I’ll provide an update on how DISA sees their role in major technology areas such as cloud and mobility playing out over this calendar year. Mr. McCoy, thank you for providing the overview. Organizationally, the DISA realignment focusing on “5 Cs”: cyber security, cloud, collaboration, and command and control, strengthens, brings to forefront, and places renewed emphasis on the evolving need for innovatation in information technologies towards achieving excellence in Market Intelligence. An organization chart with all staff elements would be appreciated. Navigating to all key elements within the DISA family will be key to maintaining and growing relationships in the business and commercials sectors. Excellent summary and required reading for folks doing bussiness with DISA.